Meet the angriest band in the UK, and find out what is it that fuels their wrath. Here's a clue: it's NOT immigrants "stealing English jobs"! We desperately need a loud, vicious, cracking, fiery and fierce voice screaming out our woes and frustrations, from the bottom of our lungs. The problem is that often such voice is poisoned with reactionary and populist filth, inflamed by extreme right-wing and racist politics. But not with the Sleaford Mods. The Nottingham duo, formed by vocalist Jason Williamson and musician Andrew Fearn since 2012, are here to convey a message of working-class disaffection and hopelessness without pandering to bigoted resentment and nationalism. Quite the opposite, their lyrics remind Nigel Farage of what is it that connects us: our humanity. It goes like this: “St George’s flag on white van/ This is the human race/ This is the human race/ UKIP and your disgrace”, in the song Tweet Tweet Tweet. At more than 100 minutes, this slow-burn doc will follow Jason’s and Andrew’s footsteps as they conduct their daily lives and prepare for their concerts. Jason reveals that their music is entirely organic, there’s no planning and strict regime. He has no idea of “what it means to be big”. Their music is merely a reflection of their routinely frustrations. Jason used to work in a local chicken factory (also shown in the movie), and their music is undoubtedly a reaction to mundane banality and social maladroitness. These two c**nts turn fury into art (not coincidentally, “Kunst” in the film title is German for “art”). 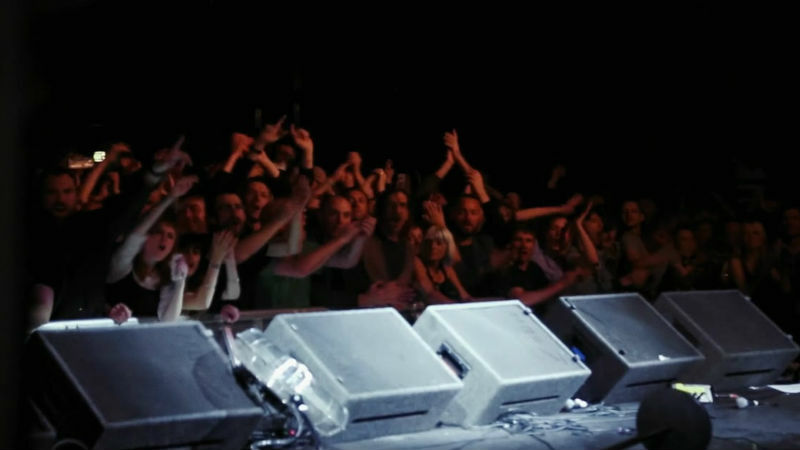 Fans engage passionately with Sleaford Mods’ socially and politically-charged lyrics. Their lyrics are expletive-laden and aggressive. If there was a beep for every bad word both their music and this doc alike would sound like a bizarre Disney cartoon. Yet there’s something mellow and gentle about the band, and – despite the brazen vocabulary – Jason’s demeanour is strangely calm. Their smooth anger is contagious. It’s cathartic. It’s a call to action. It’s call for a revolution, in a country that has never witnessed a large popular insurrection. It’s energetic and, if you can work out Jason’s thick Midlands accent, the message is clear as daylight: get out of the rat race, don’t get stuck in the benefit rut and, most importantly, capitalism and celebrity junk are NOT the answer to your woes. Sleaford Mods are probably the most vocally anti-establishment band in the UK right now, and a much needed artistic force. Punk has become largely commoditised these days, and it’s anything but anti-establishment. Johnny Rotten – who lives in a big mansion in LA – recently endorsing Donald Trump, Nigel Farage and Brexit. I would like to think Jason and Andrew will never follow a similar path!